WAIT! Don’t click away—you’re at the right place. You’re at Mummy To The Max. Our little blog has had a amazing face lift. Its coming up to a year since I started this blog and I felt it needed a change. I felt we needed to take the next step and actually get a identity, so now you can relate to us through our happy gingerbread family with our homely house. I can not take the credit for this however. A lot of hard work has gone into this new look and I would like to say a huge thank you to Mama Owl (Julie) for taking the time to design the new look and create such a brilliant set of graphics for us. 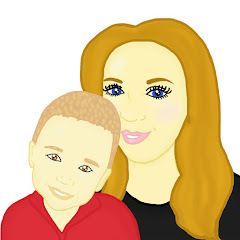 Julie is great at creating designs for blogs and you can see some more of her work here. She is very creative and is also a lovely person who helps so many people in different ways. Please pop over to her blog and say a hello. We hope you are enjoying our new look, and would love to hear what you think of it. Labels: Creative, Design, Face Lift, Graphics, Mama Owl, New Look, Work. Looks awesome my lovely - I love the logo! Loving the new look, it's very colourful.